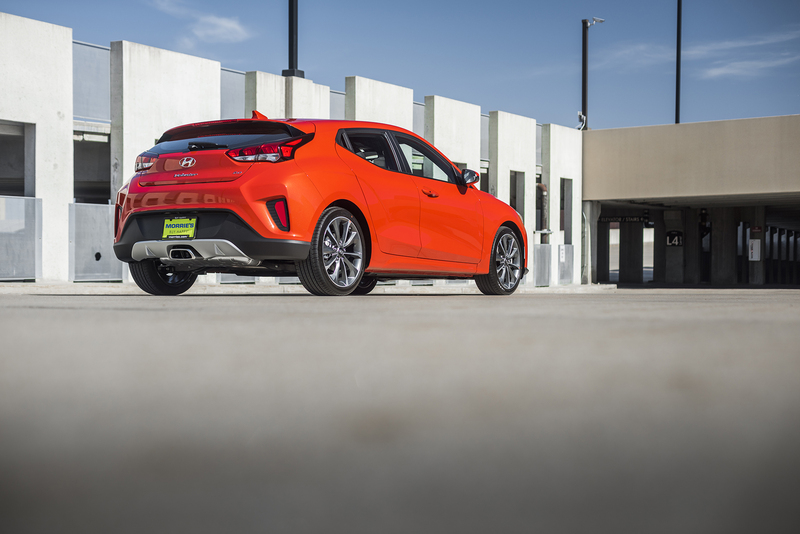 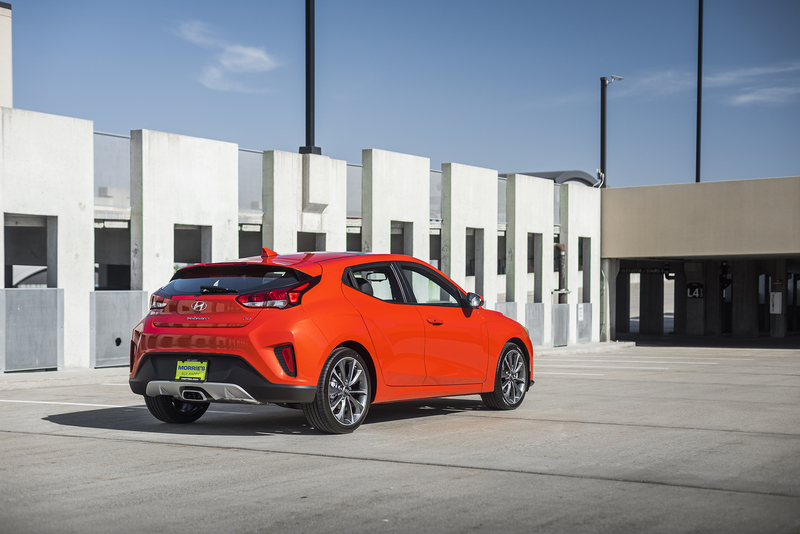 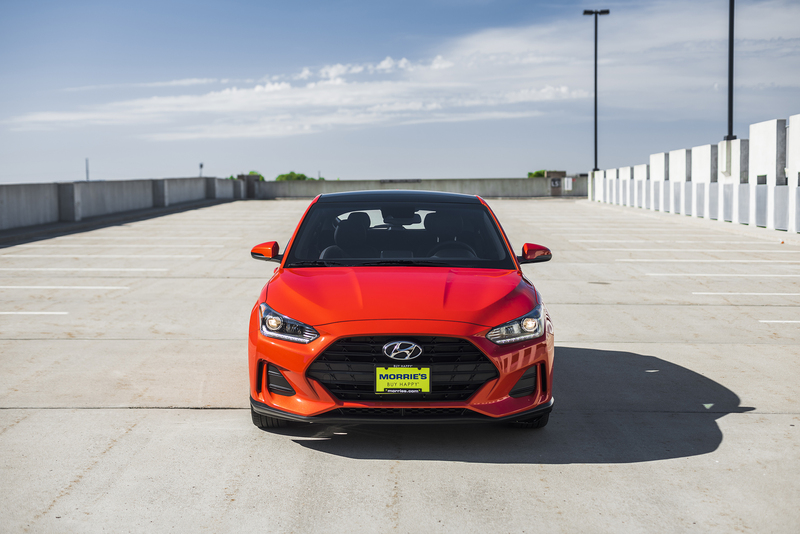 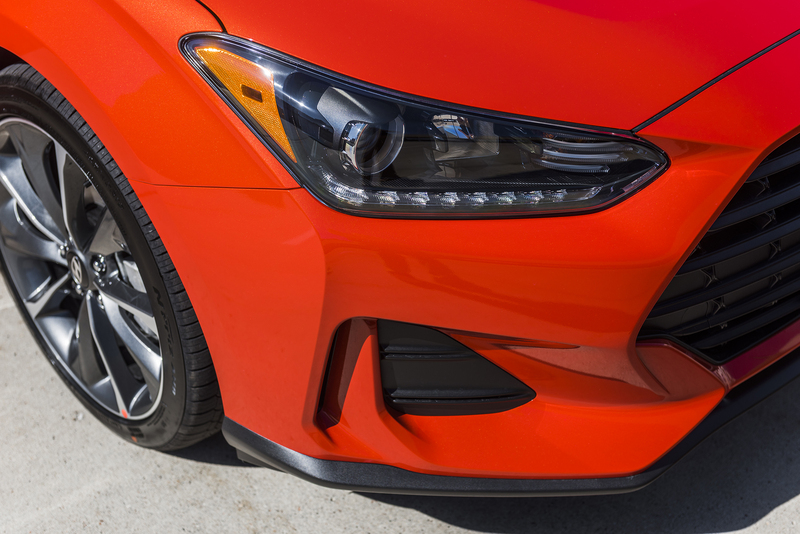 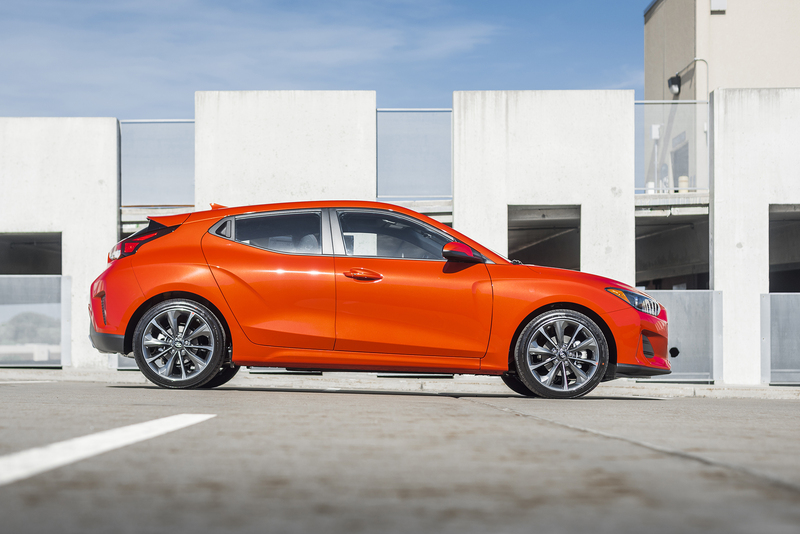 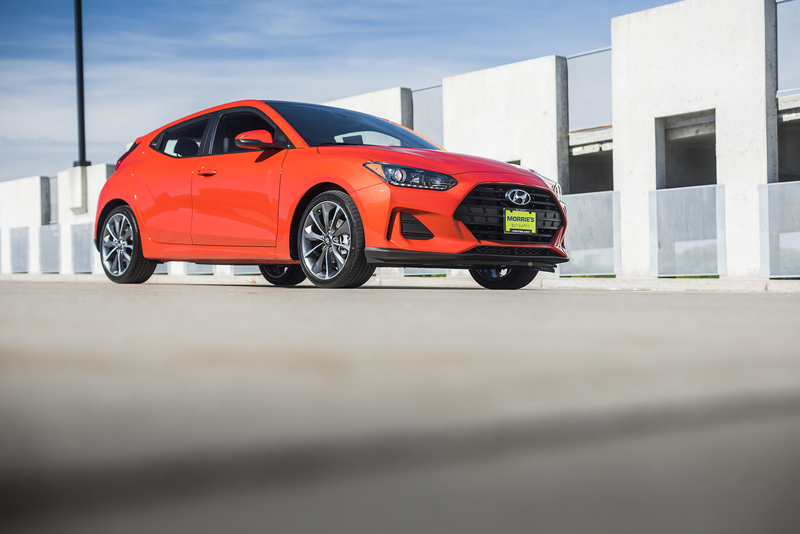 Having had numerous interactions with the first generation Hyundai Veloster including a couple thousand miles behind the wheel over the past 6 years, I was very excited to sample the all-new 2019 Veloster to see what has changed. 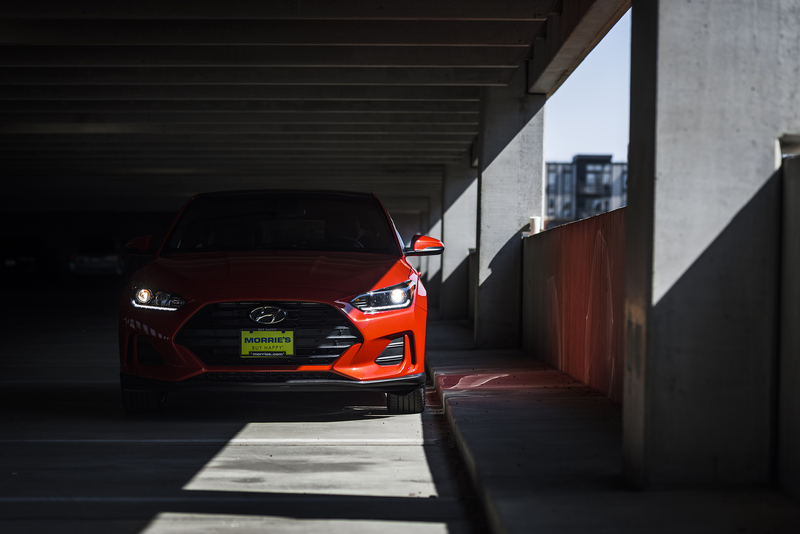 Below are some quick notes and first impressions from my brief drive in the new 2019 Hyundai Veloster as well as a gallery of photos to enjoy. 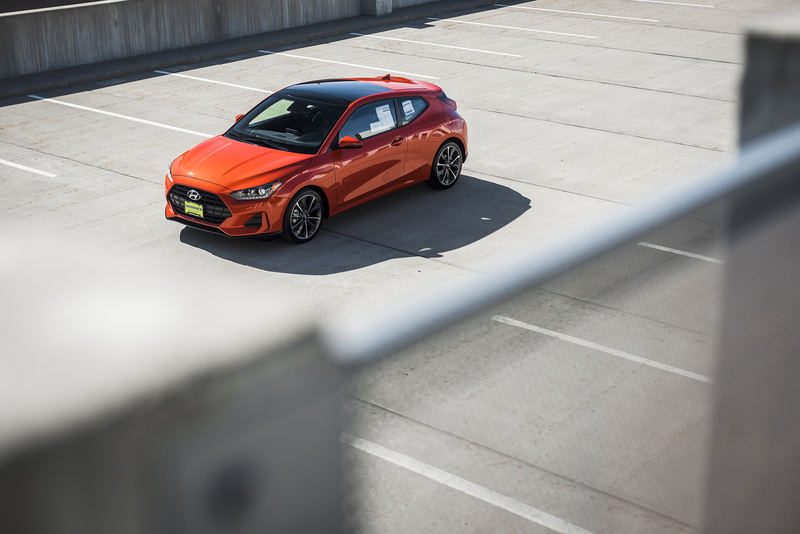 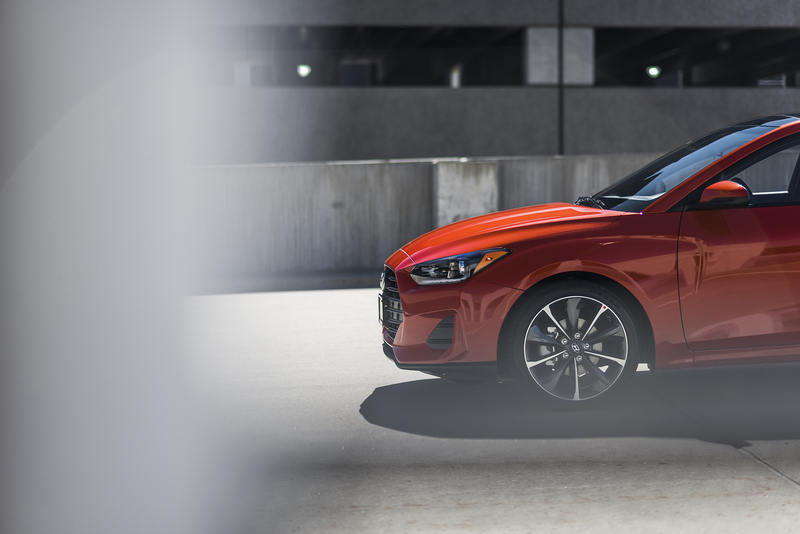 The 2019 Veloster certainly looks more grown up and refined. 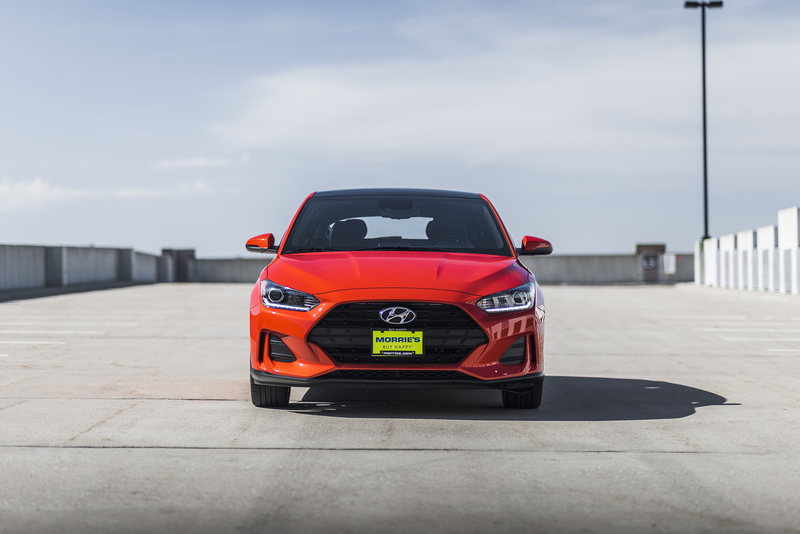 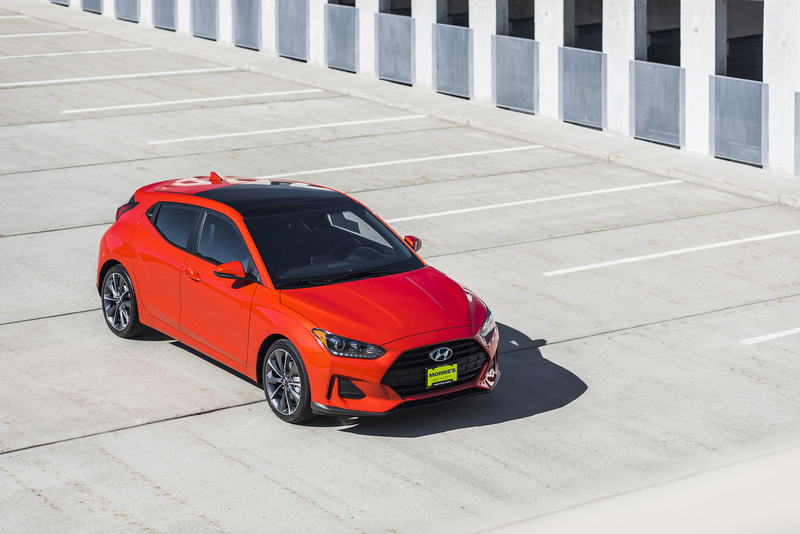 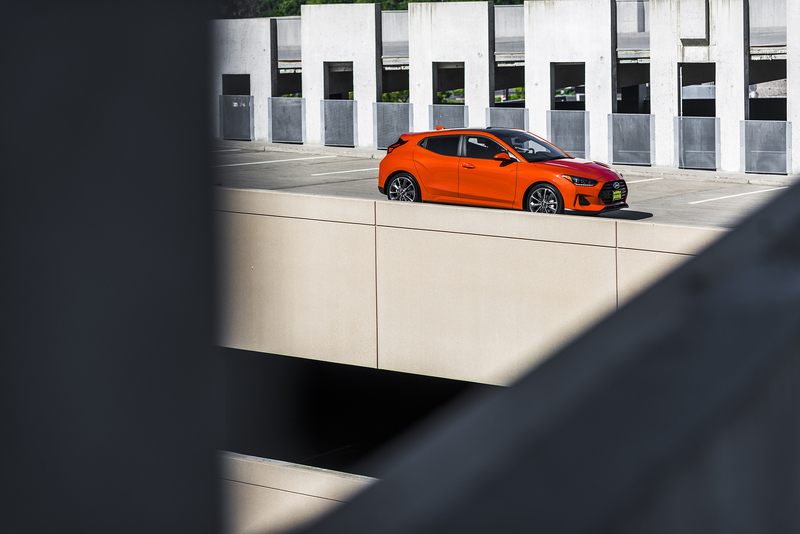 Compared to the first generation car, which openly embraced its quirky asymmetrical packaging and had very polarizing styling, the new Veloster looks much more cohesive on its own, as well as within the brand’s lineup. 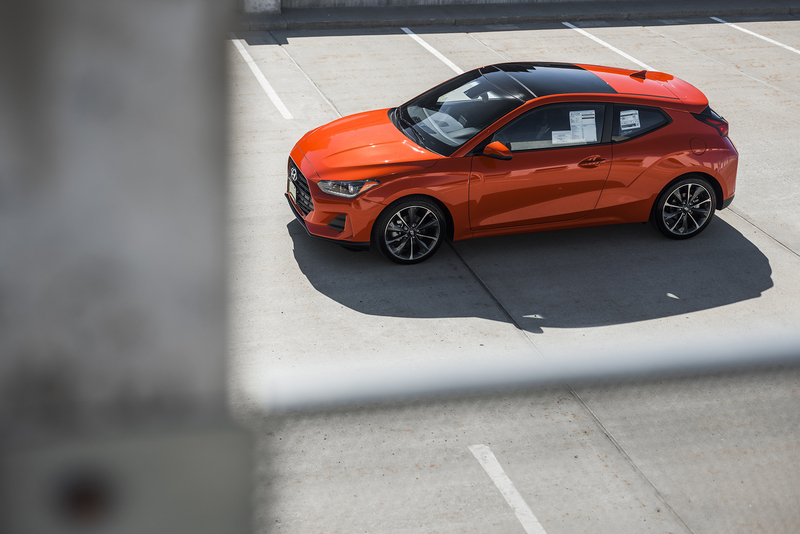 To my eyes, this new generation looks fantastic and I especially love it in this vibrant Sunset Orange color. 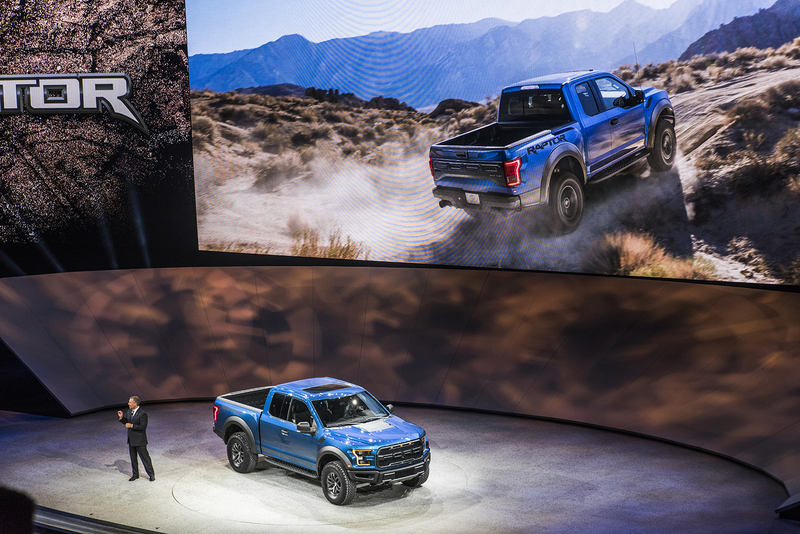 The interior feels substantially nicer inside compared to the first generation, although they’ve toned down the color pallet a bit. 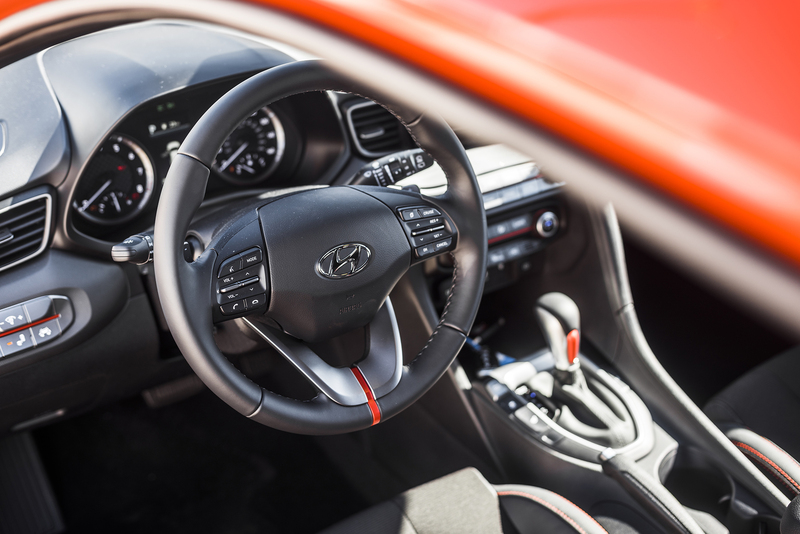 The new interior color configurations are trim-dependent and very classy. 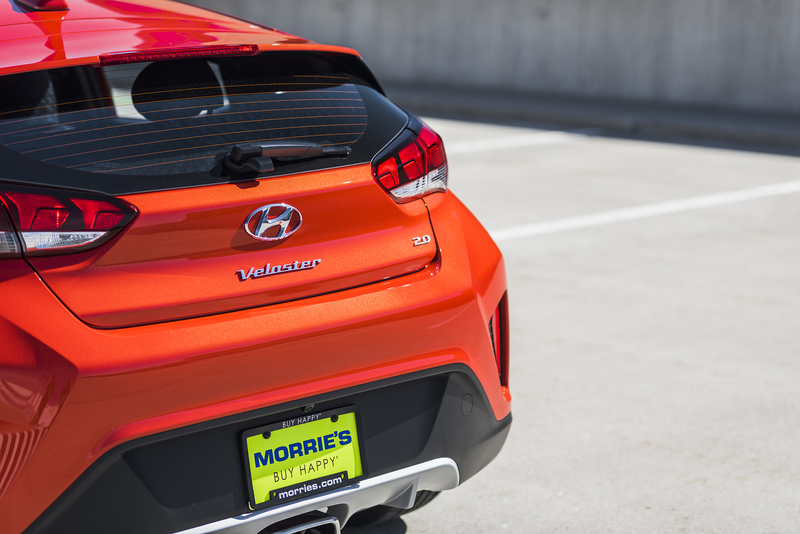 This Premium trim model had mixed leather/cloth seats that were very supportive and comfortable. 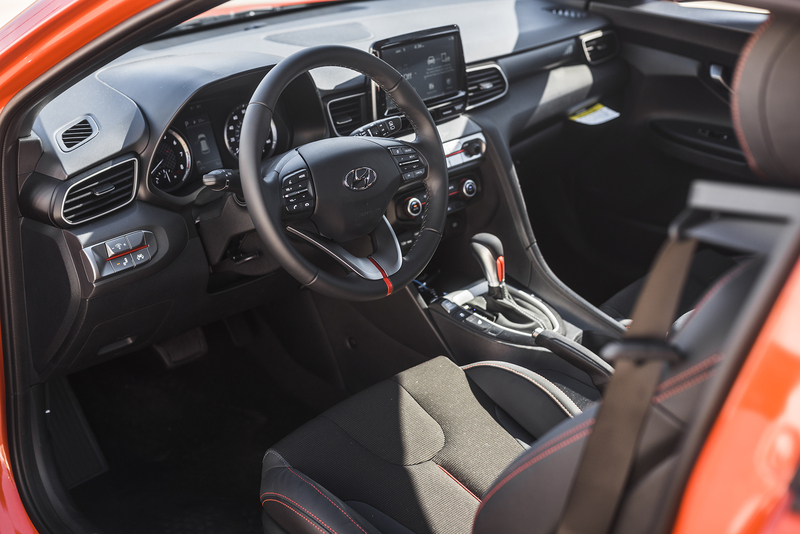 I also liked the red stitching on the seats as well as Sunset Orange accents throughout the interior, such as on the bottom of the steering wheel, on the shift knob, and through the HVAC and audio controls on the dash. 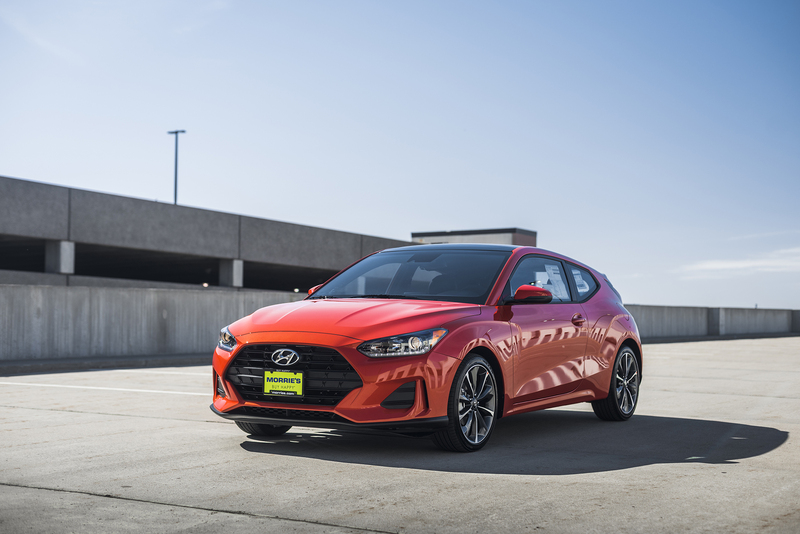 On the road, the new 2.0-liter inline 4-cylinder that replaces the 1.6-liter in the base model feels like it has a bit more grunt now, even if it’s only a 15 horsepower and 12 ft-lb improvement. 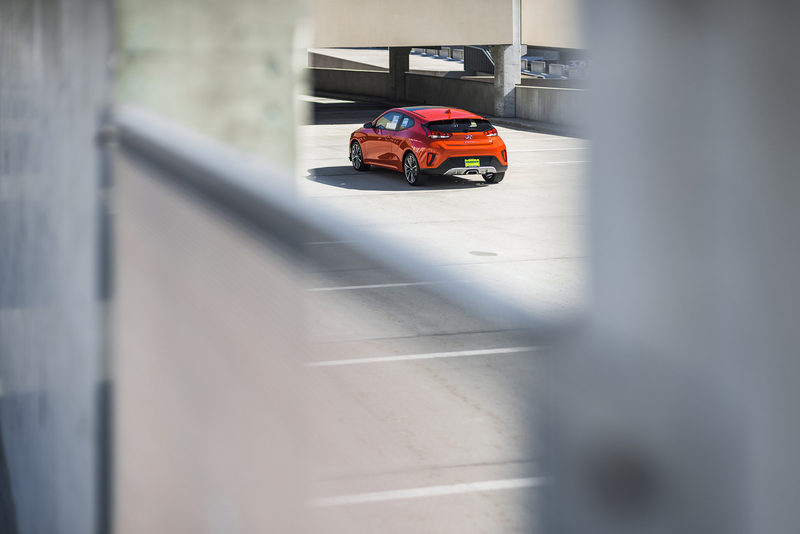 The engine in the Turbo models is identical to the outgoing model with 201 horsepower and 195 ft-lbs of torque. 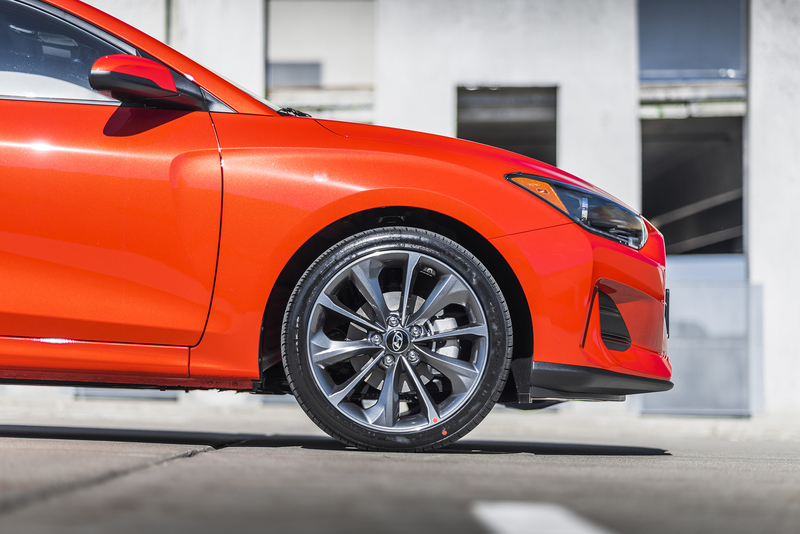 Perhaps it’s the 6-speed automatic that comes standard with the Premium trim that helps make it feel a little faster? 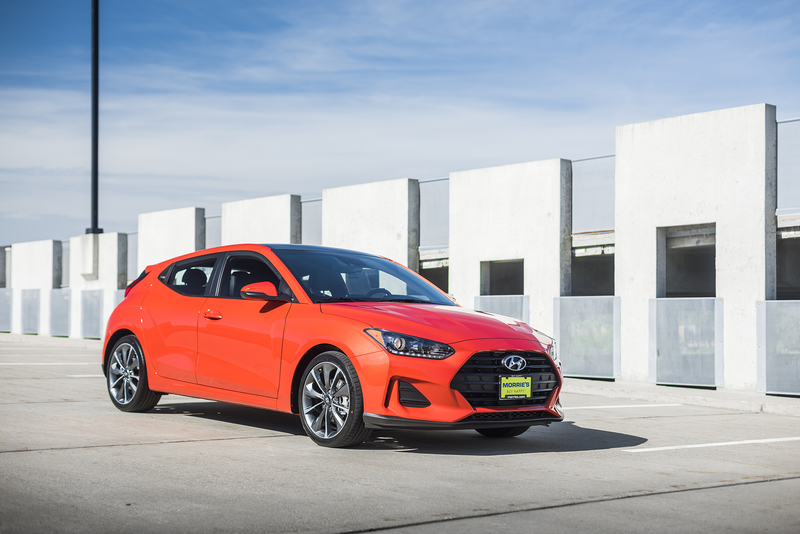 There’s also a great 6-speed manual available on the base 2.0 and Turbo R-Spec models that offers a light clutch and nice, precise shifting feel. 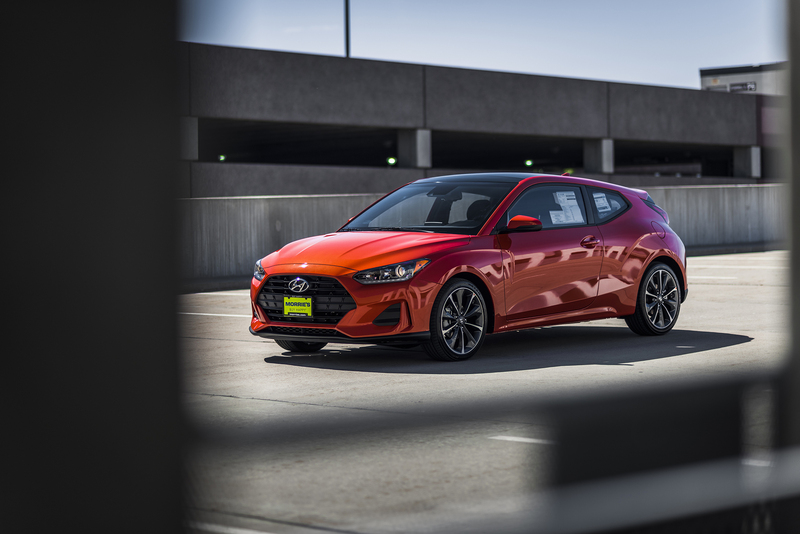 Also in the Turbo models, the 6-speed automatic gets replaced with a 7-speed EcoShift dual-clutch transmission for those who prefer to not have to row their own gears. 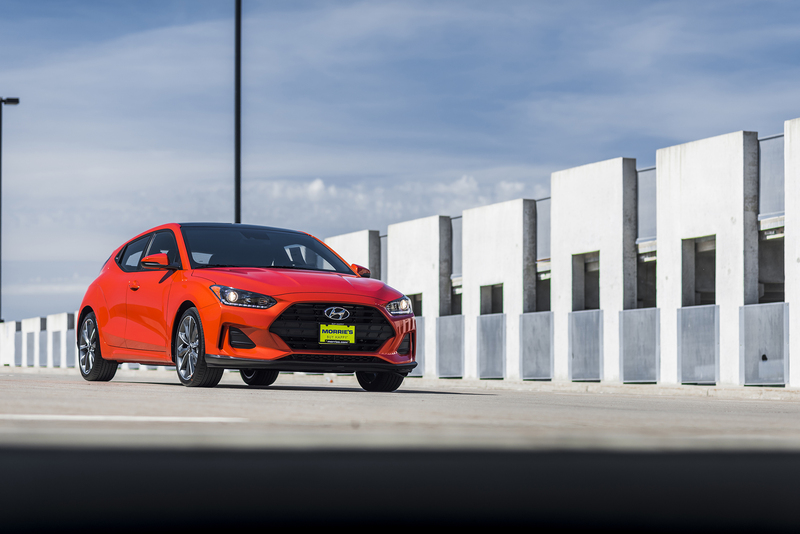 The Veloster has always been a light and nimble car and I’m happy to say nothing has changed there. 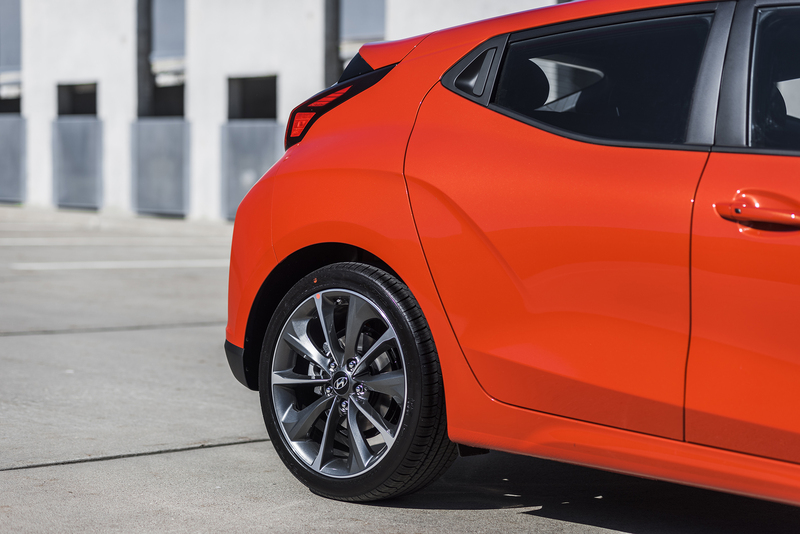 It still carves corners with aplomb, offering very predictable steering and plenty of grip. 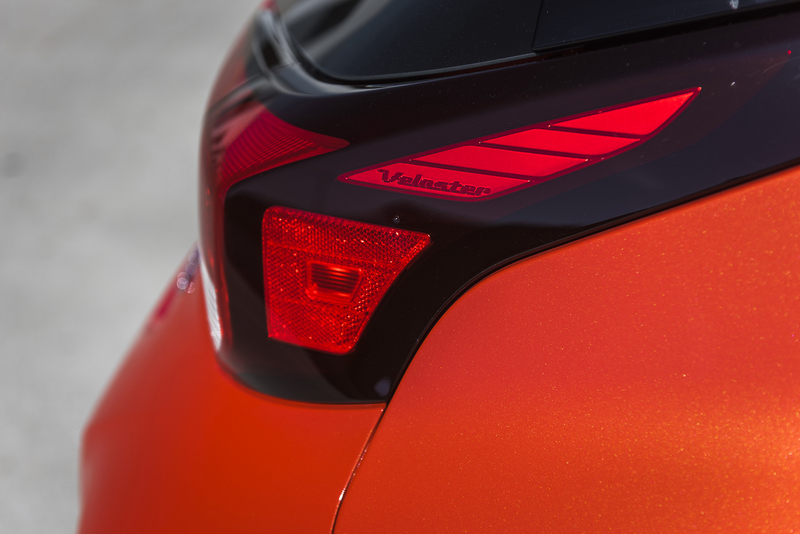 I will say that this new Veloster feels slightly more solid now. 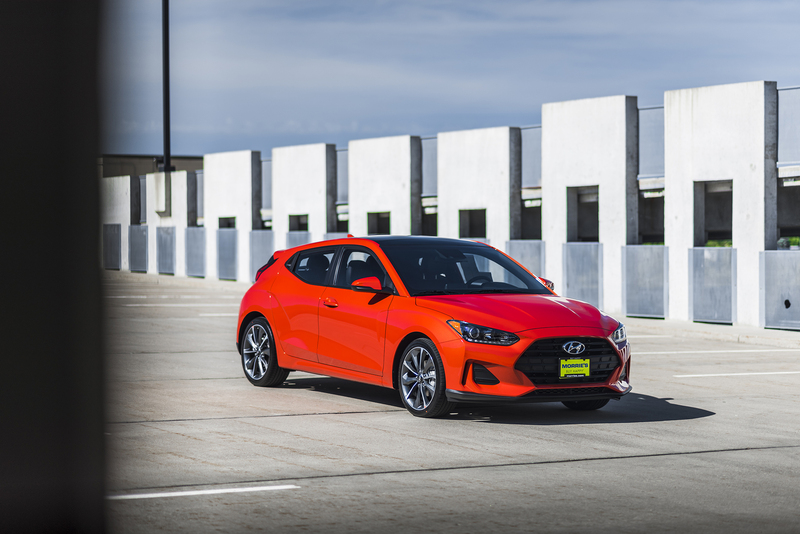 Not necessarily heavier or more cumbersome, but it feels more planted on the road without losing any of that fun tossability that, to me, is a hallmark of this car. 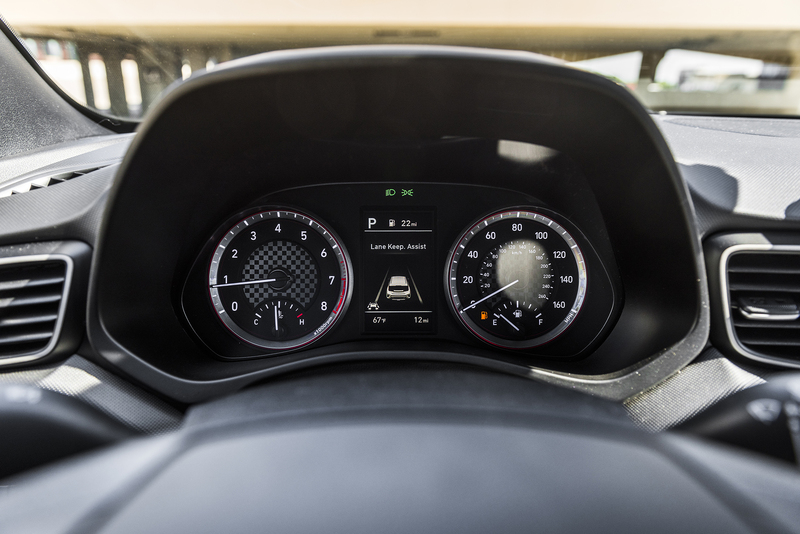 Although you do still notice a bit more road noise in the cabin than in some other cars, it’s quieter inside than in the outgoing model. 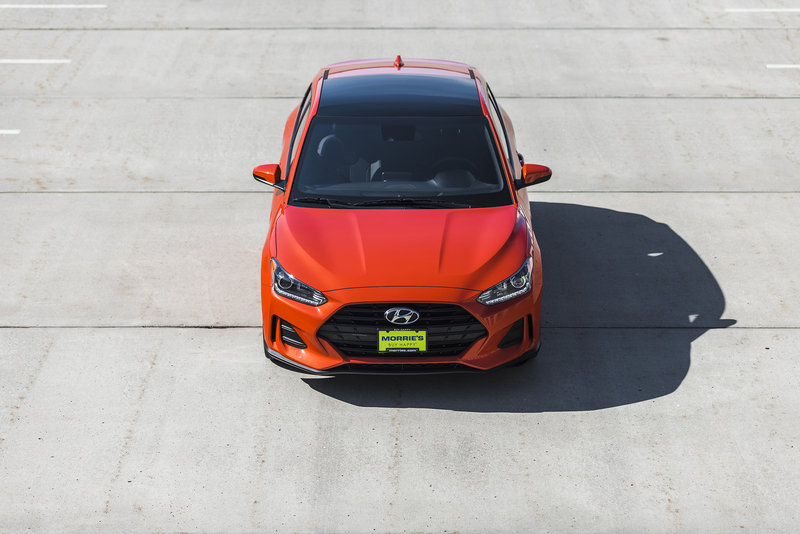 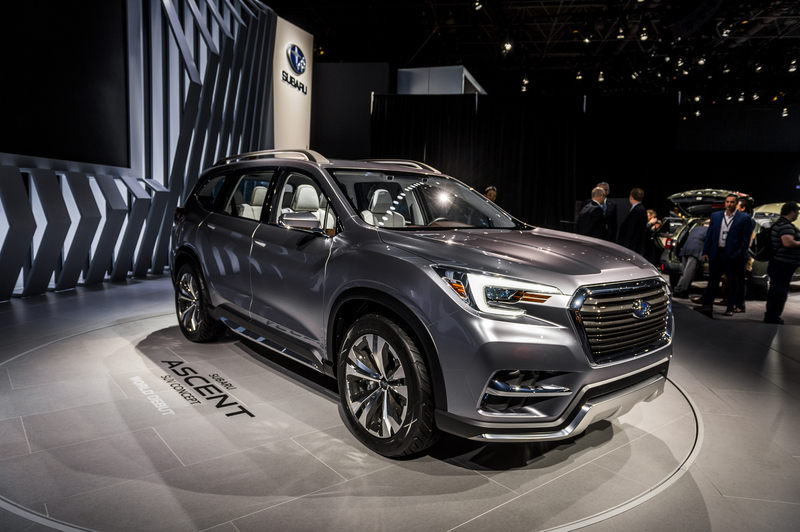 Even with the larger 2.0-liter engine in the base and Premium models, the fuel economy has stayed the same so you can expect about 30 MPG in combined driving. 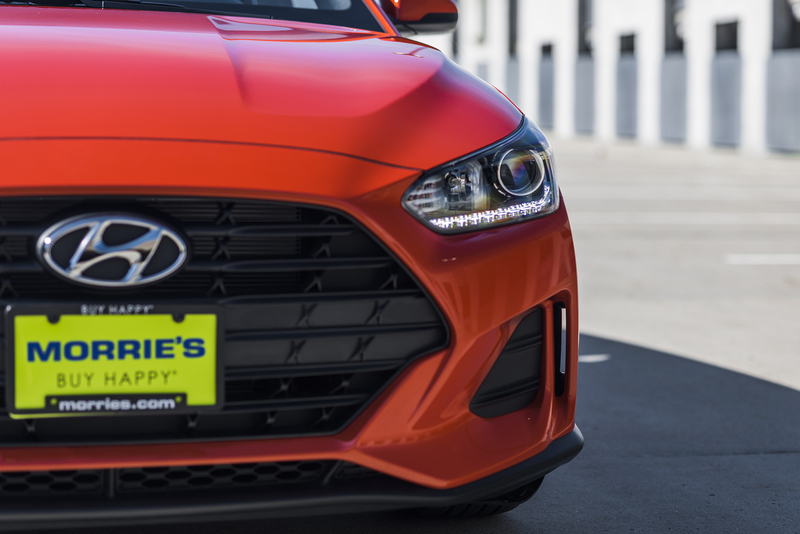 With Hyundai’s pricing strategy, there aren’t a lot of a la carte options, so it’s really easy to pick the right trim from you and know exactly what you’re going to spend. 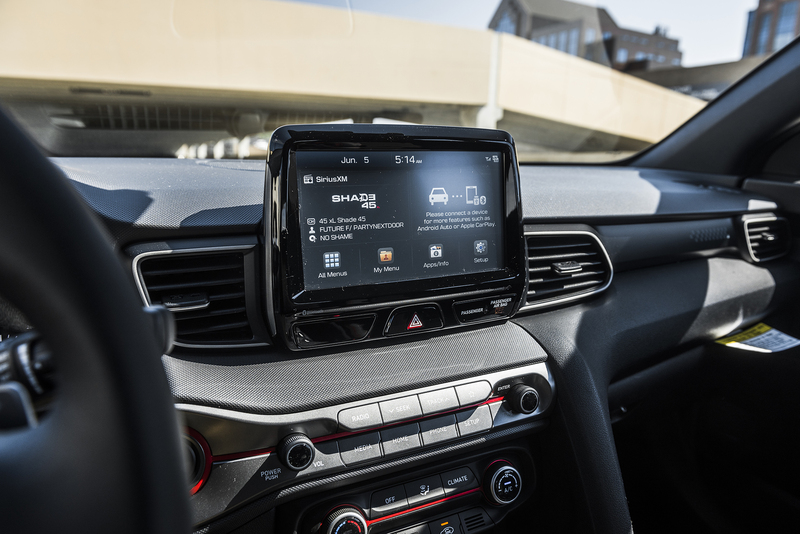 That being said, even the base model is well-equipped with a 7.0-inch touchscreen, Bluetooth, Apple CarPlay and Android Auto. 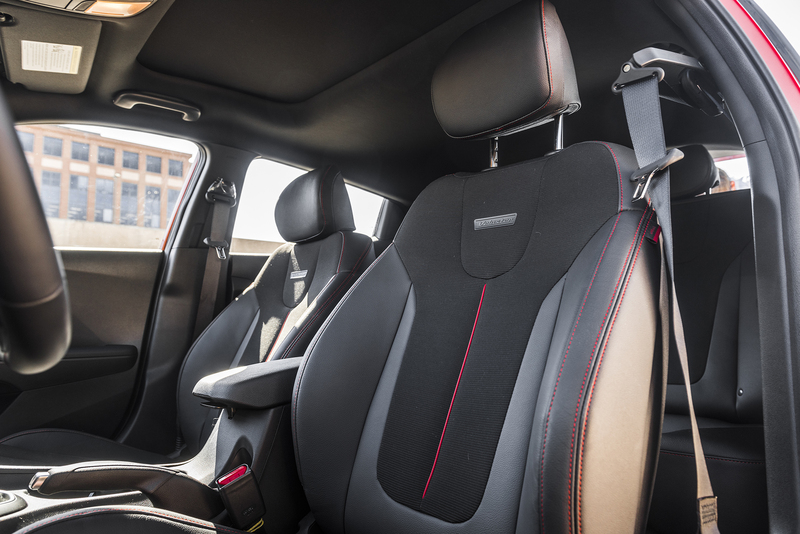 Partial or full-leather seats are also available on the Premium and Turbo models, as are heated seats. 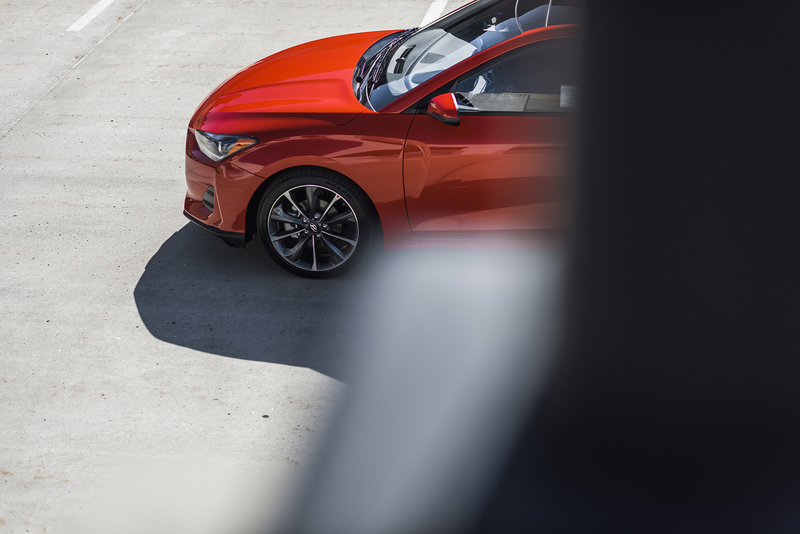 All but the base trim come standard with a 8.0-inch touchscreen and navigation is standard on the Veloster Turbo Ultimate trim, as is a head-up display. 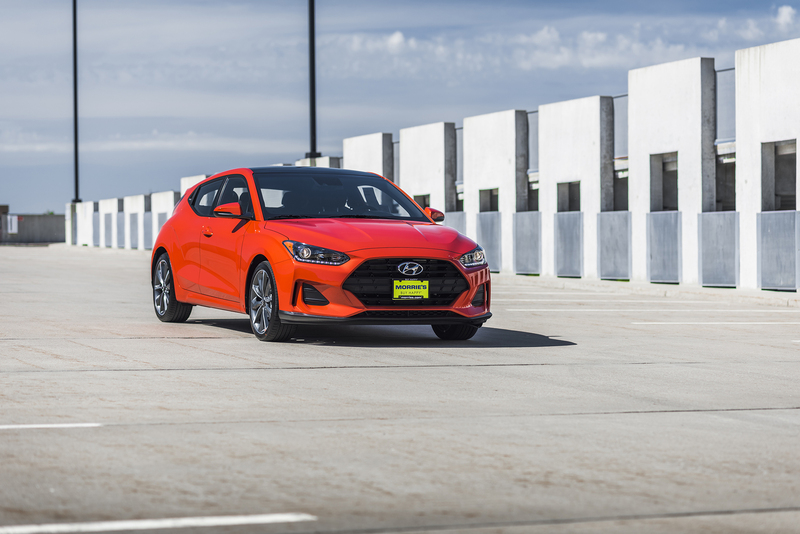 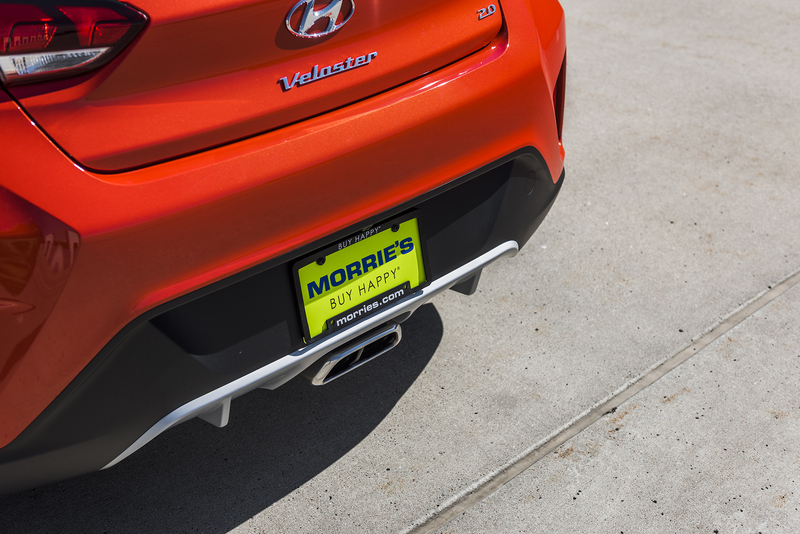 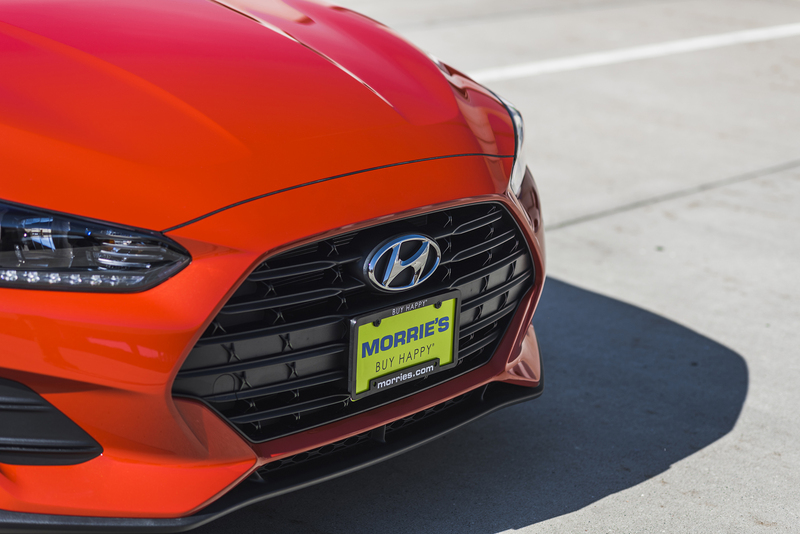 There really is something for everyone in the Veloster lineup, and with pricing starting at $18,500, it’s all within reach for most people as well. 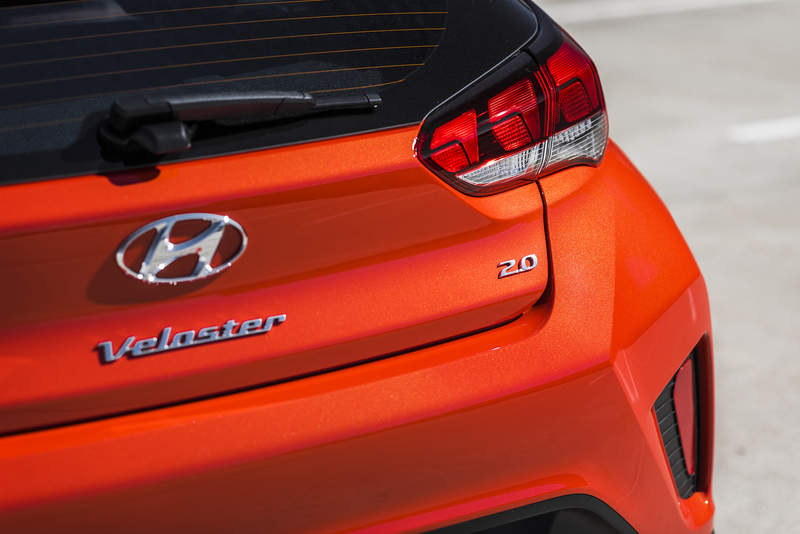 I’m especially excited for the upcoming Veloster N which will be their sportiest trim, offering between 250-275 horsepower and a torque-vectoring limited slip differential to make it handle even better! 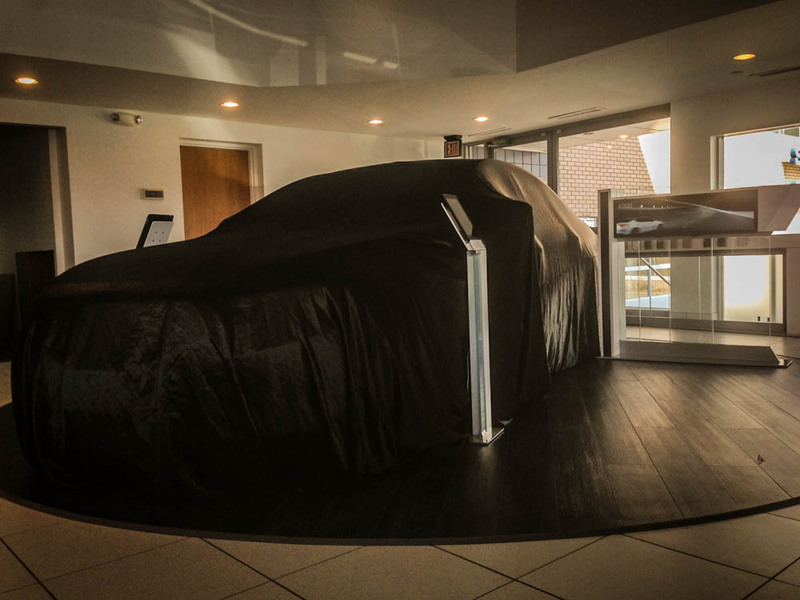 Test-Drive the All-New 2015 KIA K900 at Morrie’s Minnetonka Kia! 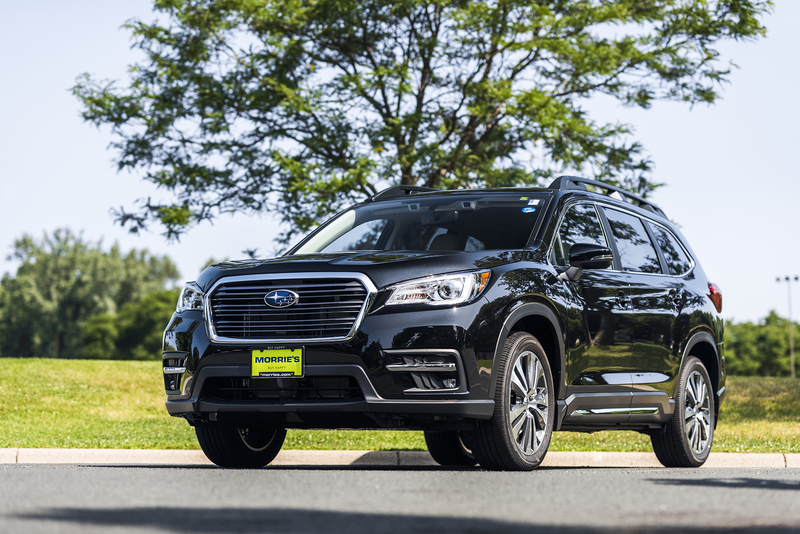 Next post Fireworks are a Fourth of July must, but busy parks can make the night a bust.